Lock on Air Chuck Haltec CH-300 / BOWES HT CH-300. The Haltec CH-300 Lock-On Air Chuck with a small head design makes for easy access to hard to-reach valves on inside dual wheels. The extended head design improves the lockon feature. 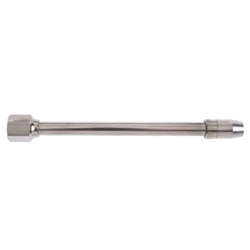 Has 1/4" NPT female threads.